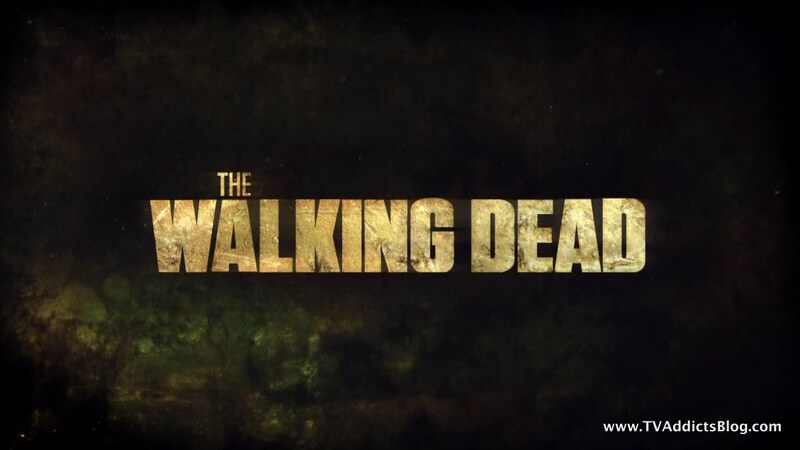 Hello fellow TV Zombies and welcome back for another helping of The Walking Dead discussion! We slowed things down a bit in episode 2, but not to worry, we weren't at season 2 levels of slowness. But, there was time to reflect on the new situation our band of survivors find themselves in. No need to elaborate here. It was a solid hour of The Walking Dead, let's recap! 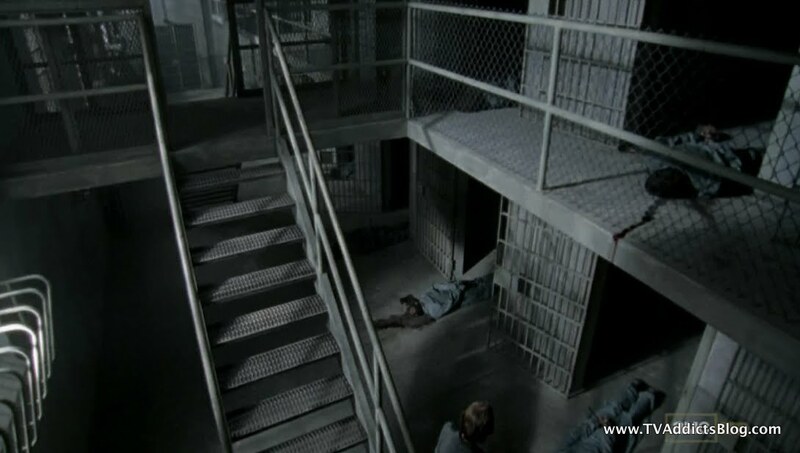 We focused solely on Rick and crew at the prison in this week's episode, so we'll have to catch up with Andrea and Michonne next week. Of course, we do find out someone is spying on the prison at the end of the episode, so that could be a hint at a potential tie-in to the 2 plots. So, there were mainly 2 stories going on here. Rick dealing with the other survivors they found while going for food and supplies. And, the medical treatment of Herschel. The episode kicked off right where last week left off. They were in the cafeteria and the other survivors came out of hiding, with one gun among the 4 of them. Rick's main focus is on getting Herschel back to C-Block. 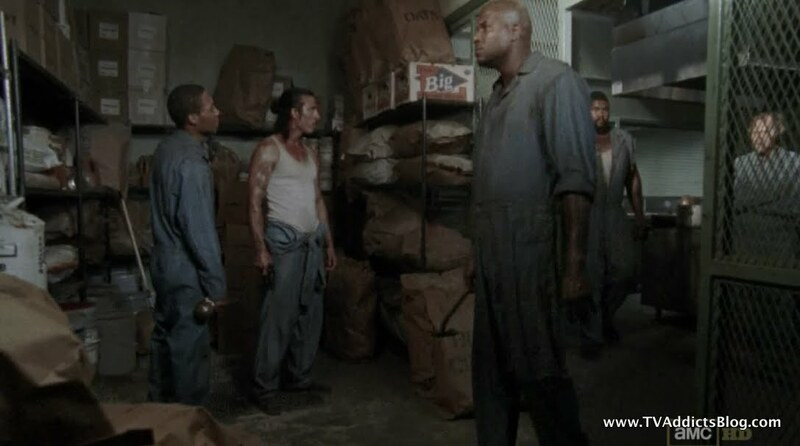 T-Dog took the one armored walker waiting at the door for them, and then they high-tailed it back to their home base. (following Glenn's navigational arrows of course) But, they weren't alone. The 5 people they found followed them too. 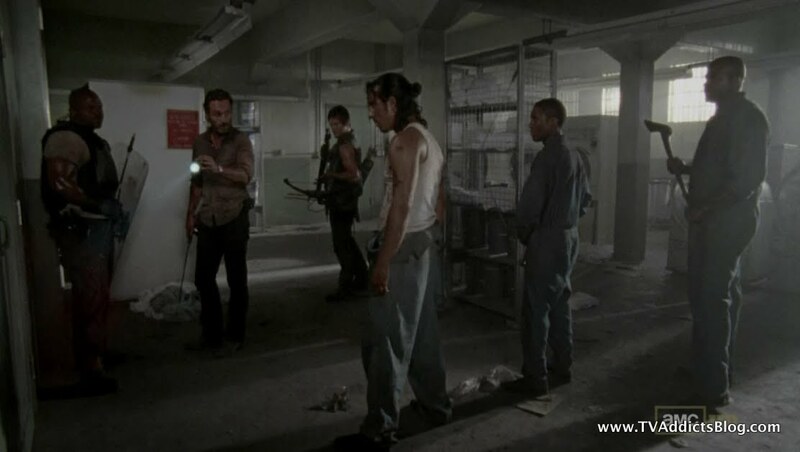 Darryl stayed back from the entrance to C-Block with his crossbow to hold them off. And this is where our story splits. 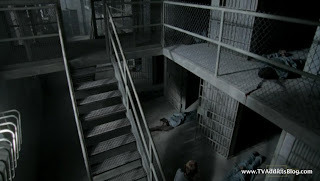 Tomas is dead set on getting his C-Block back so he can stay in his cell. 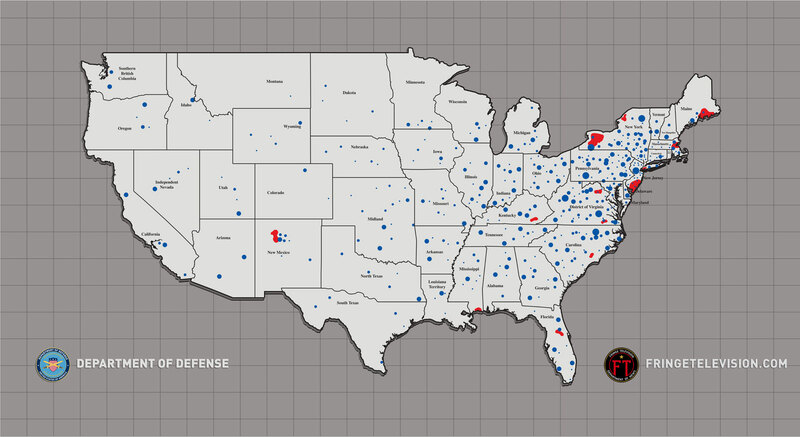 They were here first, so it's their prison. Some guard had locked the 4 of them away with the food storage which allowed them to stay alive for 10 months (292 or 294 days depending who you talk to). Rick and crew had to catch them up on what has happened to the rest of the world, how there's nothing left and probably half of the population is wiped out. They even took them outside to show them the grounds littered with dead walkers. Rick arranges a deal with the 5 to split the remainder of the food supply (which was a lot more than the group led on) and they'll help them clear out another Cell Block for them to stay. It's safe to say there was a major lack of trust going on here. Rick confided with Lori that he felt the best approach was to just kill them. He had done it before in the bar last season. All he cares about is keeping his group safe. 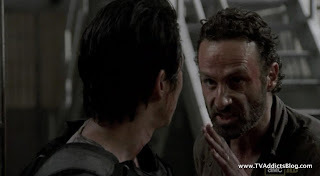 Lori told Rick that she knows he's not a bad person and if he thinks killing those people is the best option, then he should do it with a clear conscience. 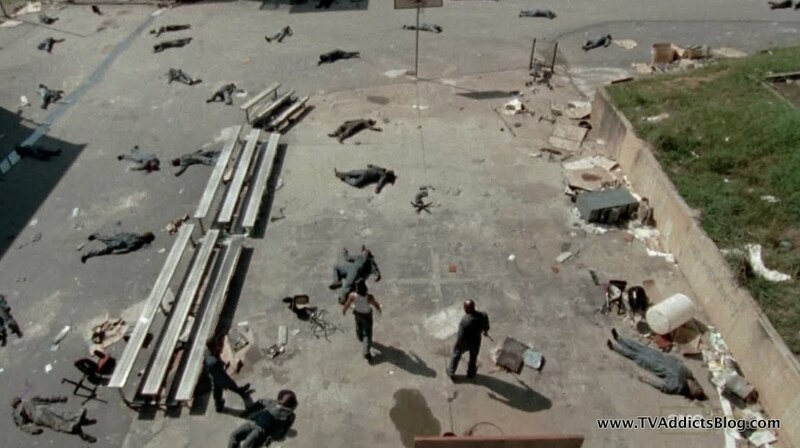 So, the crew sets out (Rick, Daryl, T-Dog, Tomas, Big Tiny, Redneck guy, Oscar and the other guy). 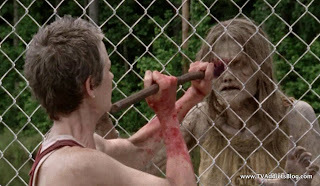 It was pretty funny watching the inmates take on their first walkers. They disregarded any information they learned from Rick and crew and started going for body blows and such. By the time the next scene rolls around we see them all going for head shots. They do run into a dilemma when a walker rips off his arm that was handcuffed to end up with a sharp appendage. He scratched Big Tiny's back which most likely meant he was infected. They sat around debating for awhile. Rick already knew the answer. But without hesitation, Tomas just goes to town on his former buddy. He hacked Big Tiny to pieces and the look on his face was of pure salivating pleasure. This man was a killer by nature and it was easy to tell he would be a threat to this group. They get to D Block and force Tomas to open the door. Rick instructed him to open one door so they could control the flow of walkers. But Tomas had an issue with the door (at least he claimed). He opened both doors and a hoard of walkers came at them. His excuse? "sh*t happens!". 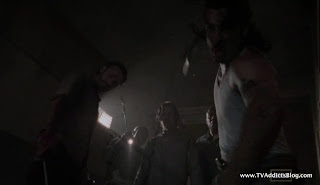 Then Tomas took a close swing that could have hit Rick and also threw a walker on top of him during the fighting. 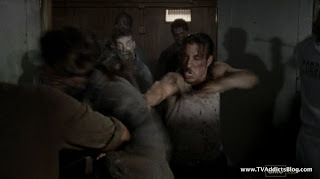 Daryl was able to save him before any bite took place. Tomas tried to play off what he did saying that the walker was coming at him. Rick understood retorting with, "sh*t happens". 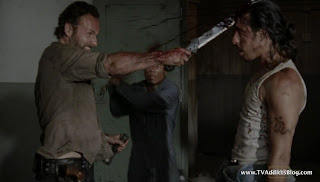 Then without hesitation, Rick takes an axe to Tomas's head. OUCH! 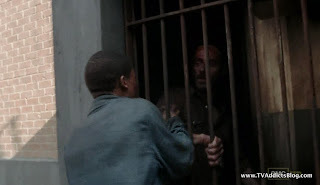 The Other guy made a run for it and Rick chased him into a prison yard full of walkers. Rick closed the door on him and advised him to run. WHAAAT!?!?! This Rick ain't messin around! And then there were 2. Redneck dude started pleading for his life saying that he's not a killer and they had nothing to do with the setup. Oscar refused to plead for his life but you could tell that these guys weren't loose canons like their buddy by circumstance, Tomas. Rick kept his word and took them to D-Block. Lots of Redneck Dude's friends were dead twice over in there. 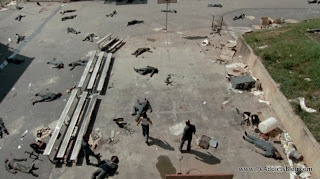 Rick promised that if he ever were to see either one of them near C-Block and his crew, he would kill them. Yikes, he ain't messin around! Something tells me we haven't seen the last of these 2 guys. But, you never know. 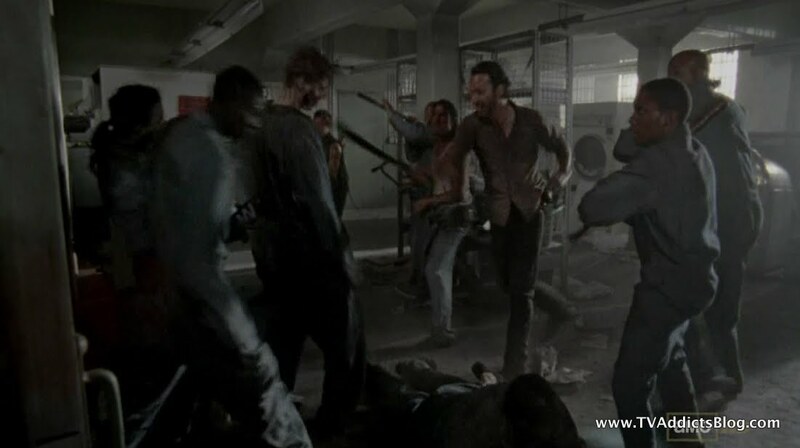 So, while Herschel's leg was chopped off we still weren't sure how this was all going to turn out. 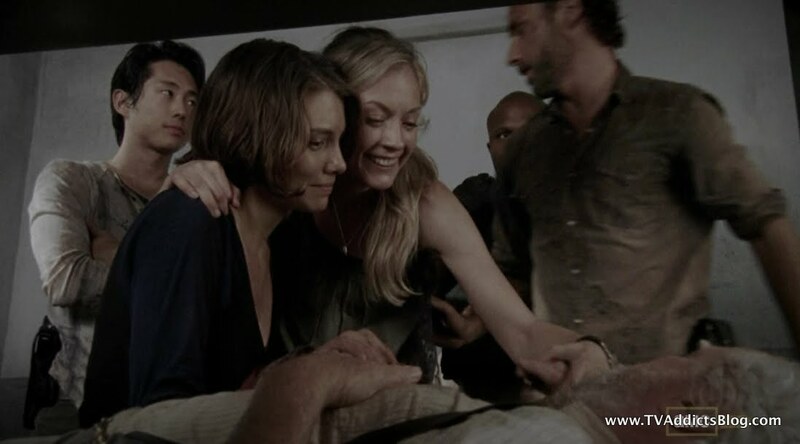 Carol apparently was given some medical lessons from Herschel of the off-camera time in order to be able to help or actually deliver Lori's baby via c-section. So, she took charge on treating Herschel. Mission number 1, stop the bleeding. Glenn was assigned by Rick to never leave Herschel's side and to take him out of the equation if he ended up dying. Rick also ordered Herschel to be handcuffed to his bed, just in case. Carl took things into his own hands and went wandering off, found the infirmary, killed 2 walkers and came back with supplies. Needless to say, Lori was furious at him. But, Carl didn't really care. 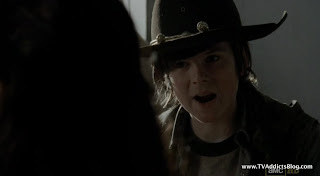 Beth tried to yell at Carl for talking to his mother that way, and Carl just ran away. This kid is CRAZY!!! Maggie had already given up on Herschel surviving. Lots of debates happened on what the group would do if he did survive. 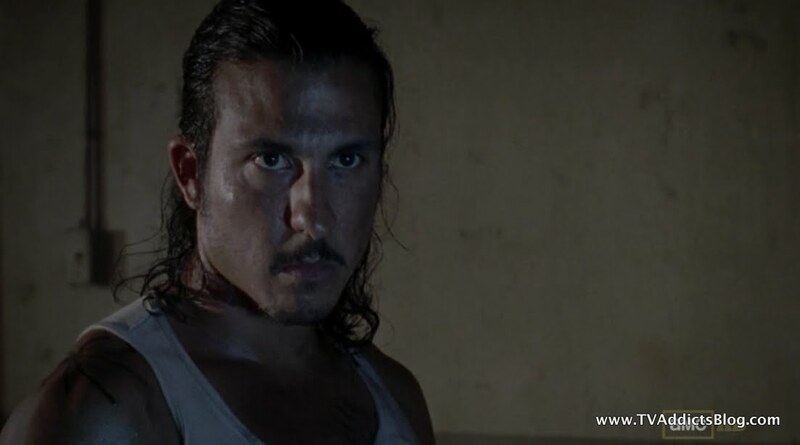 They would need crutches, he would be a burden on them, etc... Beth was already cutting pant legs shorter to anticipate his survival. Meanwhile, Maggie wanted some alone time with Herschel to tell him it was okay to let go. 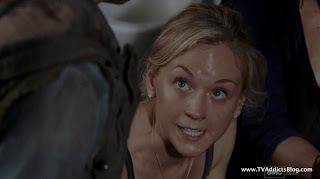 She and Beth would be okay because he taught them so much. 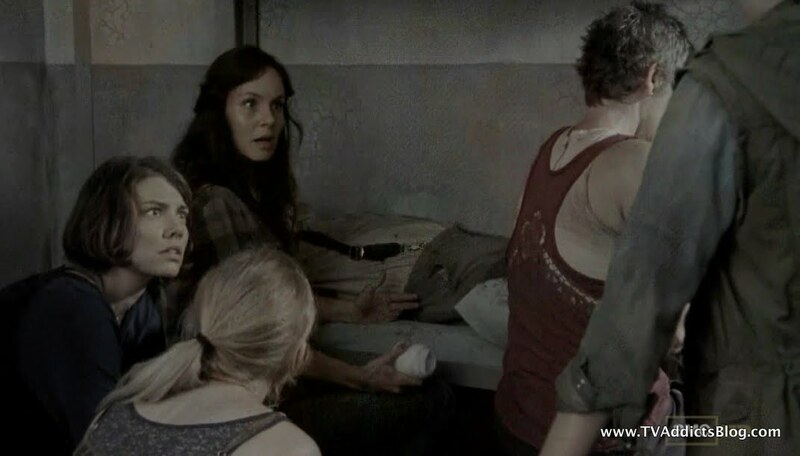 Carol knew that she'd need to be better prepared to deliver Lori's baby because Herschel may not be around to assist or may just be incapable of assisting. She asked a reluctant Glenn (already on orders) to come with her to the prison yard. She picked out a female walker and said she had to practice c-section incisions. Interesting to note that once they picked out their walker, they didn't kill the other ones. 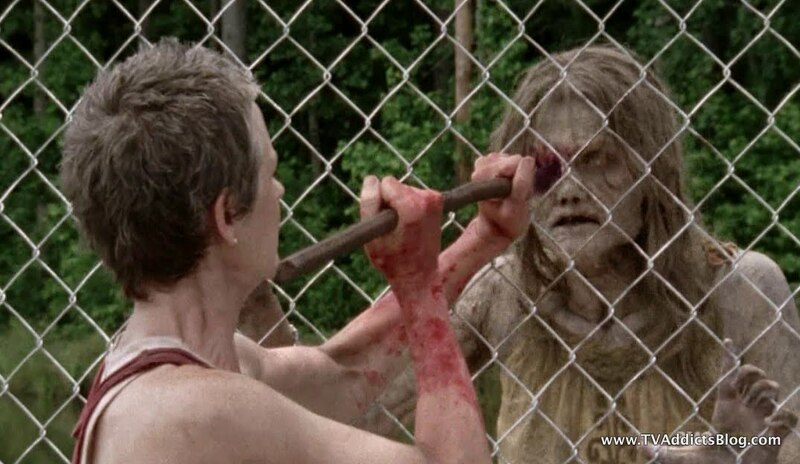 Glenn just created a diversion and led them away while carol brought her test body onto their grounds. 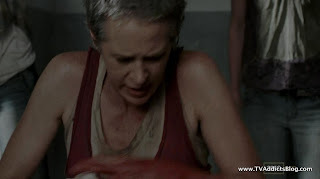 As I mentioned, we see Carol working on her incisions at the end of the episode and it appears that someone is watching her. I have my theories, but they're potentially a "little" spoilerish (from previews I've seen) so I'll just stay quiet for now! 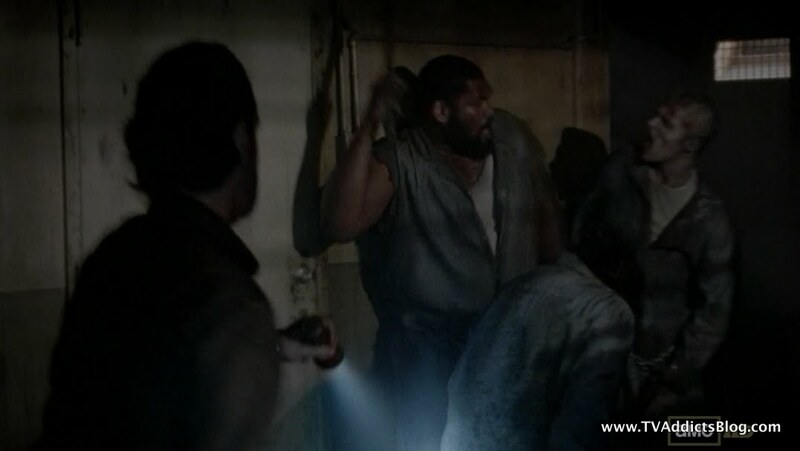 Meanwhile, Herschel stopped breathing at one point and Lori came in and started CPR. 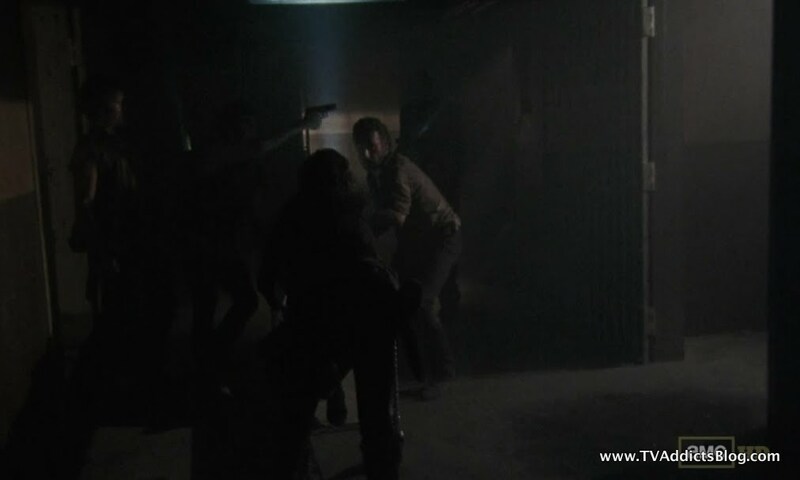 It looked like they were trying to throw us off and make us think Herschel was biting Lori as a walker (Some people were probably really hoping for this), but it turned out that Lori saved him. Carl actually seemed impressed in his mother. Perhaps, he'll start warming up to her again? Rick and crew got back and everyone huddled around Herschel as he opened his eyes and he was still alive!! I'm going to blame the music that almost got me choked up when he reached for Rick's hand in almost an acknowledgement of thanks for chopping his leg off and saving him. There were smiles from the whole crew and maybe even millions of viewers as we discovered Herschel will live to see another day. 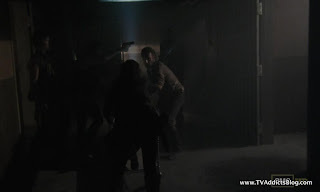 There was another moment between Rick and Lori to end the episode where they discussed plans to clean up the next day now that things are settled down. Rick assured Lori that she's not a terrible mother (based on a comment she made earlier in the episode). Lori was almost hoping Rick had come out to talk about them. And while he couldn't bring himself to open up to her fully, he did place his hand on her shoulder and tell her they were awfully grateful for what she did. He walked away, and Lori just smiled because it was probably the biggest showing of affection that she's seen from her family in quite awhile. Of course, it may have been a half smile/half starting to cry because they have a long road to recovery if they ever will. So while we end on a happier note, the debates on what happens if Herschel survives don't go away. He will most certainly slow them down if they're on the move. They're going to have a crippled man and a screaming baby in their crew. 2 very big liabilities. I'm definitely interested in tuning in next week to see how things play out! No Revolution this week, but Fringe will be back on Friday. This is also the first week where I posted a dedicated spot to talk about all other shows. Hopefully, it will get us more organized around here! I mentioned last week that the first couple weeks of November are going to be rough on recapping for me. But, I'll probably most some catch-up discussion posts when I get back. Hope you enjoyed my ramblings and I'll see you next week! LOL - I guess I didn't feel it slow down much cause when it was over I was like.. what ? Fastest 40 mins on tv ! When Hershel woke up while Lori was giving him CPR - yup we thought for 5 secs that she was about to get bit ! LOL They did that well. Loved the turnabout that Rick was now the one to tell others about all they'd missed when it was originally him who had to catch up on the new world. 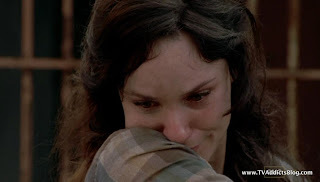 Very touching when Maggie told Hershel it was ok to go though. 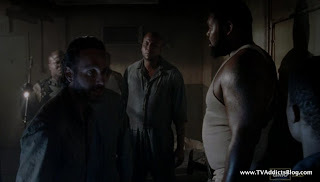 They continue to show how hardened Rick has become with him kiling these inmates. Last year he killed those guys in the bar but he wrung his hands ove it and felt bad - not any more ! 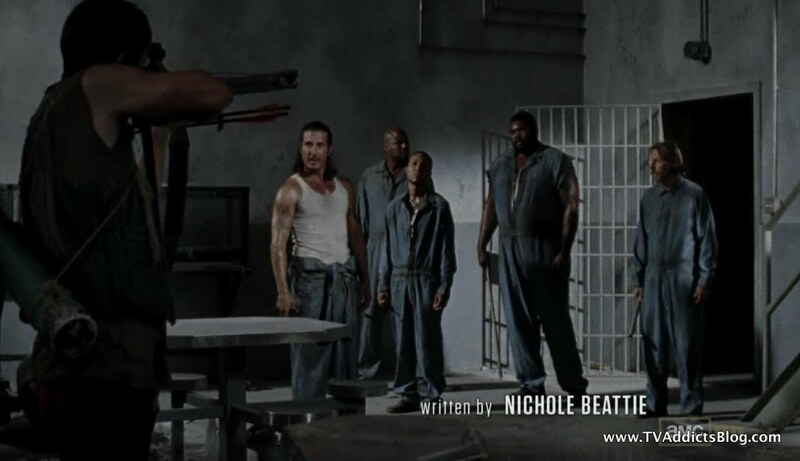 Imagine if nice-guy Rick met these inmates back in the day ! Wasn't it just last we that it came up that none of these zombies ever seem to smell like rotting flesh - but this week the had the rotting food smell. Funny. best gore: Hershels stump and that walker who rips his hand off ! 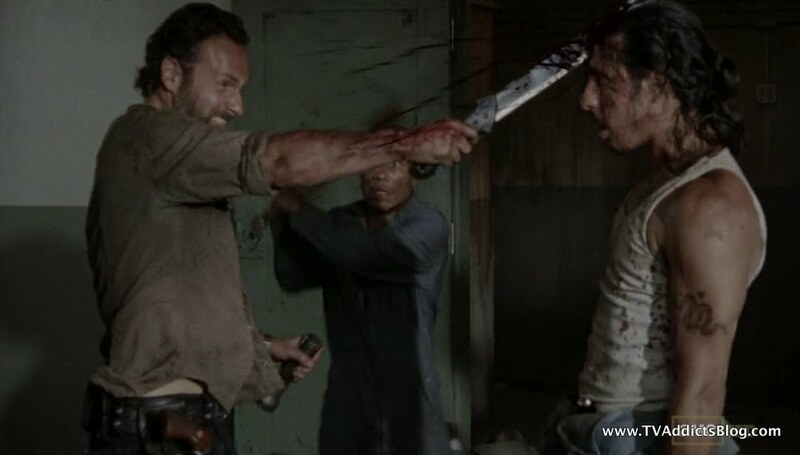 Plus Rick axing that inmates head ! But leaving that other inmate in that yard - that was harsh ! Don't have much time to comment right now but thought I'd respond briefly since I read your comments! Agreed on them showing how much Rick has evolved since last season, and even more so since season 1. Scratch = infection...I thought that was in the explanations in season 1 but I could be wrong! lol Agreed on getting Carl in line. But, not sure how much they're going to be able to tame him. We'll see! 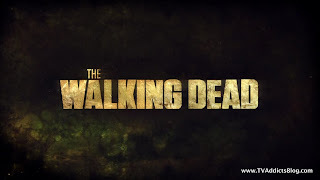 Been swamped today - but pasted some links about TWD. Haven't even read most of them yet. LOL think the last one is talk of the next ep to come though. Funny when the prisoners were discounting the group’s instructions on killing the walkers like killing was something they didn’t need help with. Tomas looked pretty scary with the glee in his eyes when killing Big Tiny. 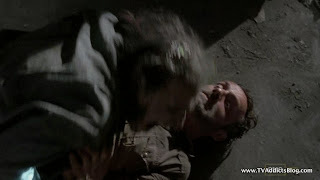 Really gross when Rick took him out, but a good thing I’m sure. Carl is pretty brave, but also stupid. If they have learned anything, they should know not to go anywhere alone. I know he’s trying to prove himself. Guess his childhood and innocence are officially gone. Carol was showing a much different take charge attitude in this episode. Kinda gross about practicing the C-section on a walker, but I guess it makes sense. 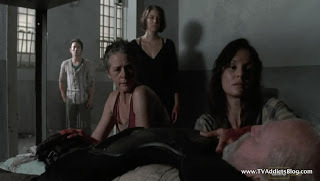 The scene with Maggie talking to Hershel got to me. For a second, I was worried he was gonna bite Lori. I saw in “Talking Dead” that he fell asleep a lot while shooting that scene. 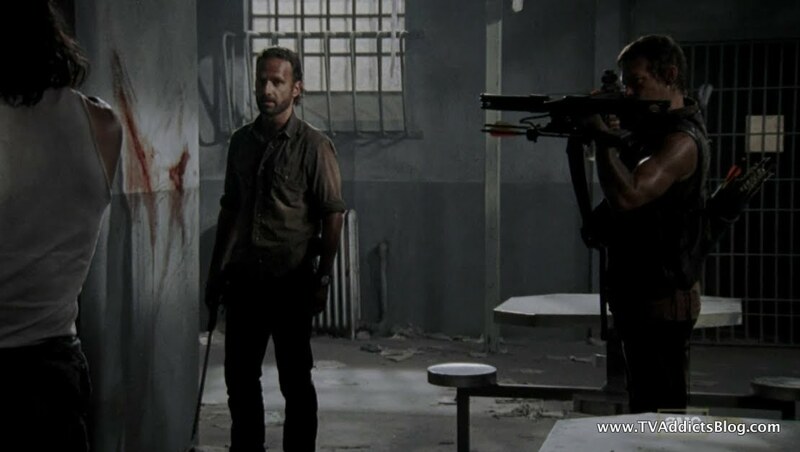 lol Carl was right there ready to shoot if he had to. He’s sure taking after his dad. Man, I'm slacking today. Thanks for the links MJ! I haven't even been on EW today. Swamped! lol I'll check them out. Love those weekly Kirkman interviews. I was about to say Carol probably has changed the most out of all of the characters, but thinking about where Rick and Carl started, that's not necessarily true. But she definitely has become a little more outspoken and "take charge" as you said. I only watched half of Talking Dead last night and didn't have time to finish...but that's hysterical that Herschel (the actor) was falling asleep during takes! lol I can imagine that would happen! Great EW columns! Got all teared up reading the background on Maggie/Herschel's scene and also everyone's comments who identified closely with the scene. Whew. Oh my! Just read the EW article about that Maggie/Hershel scene. Got to me all over again! Had to stop reading the comments. It makes perfect sense that it was written from a personal experience, but that makes it even more moving to me having said the same thing to both of my parents 8 years apart. I'm swamped at work so I haven't even read them yet ! Nor watched Talking Dead. But maggie is also a much changed character this year. Saw Talking Dead - very funny on the 'napping'. LOL Wil Wheaton was so funny, esp about Data from STNG having zombie flesh on his android skeleton. And the host's reaction to that. By the way - did see in some article that it def was the first time the show has shown that you can cut off an infected area to stop spreading.